Is there anything more haunting than the cry of a pair of loons at 3 a.m.? You are lying in bed in a dark cabin - no moon, no stars, no lights outside or inside the house. For some unknown reason you are awake and suddenly a first cry comes - instinctively you know there will be another . . . and another . . . and another. 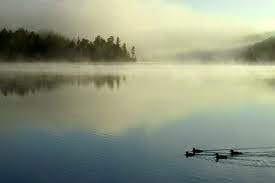 Only loons can make those sounds that carry across a lake. If you listen attentively and for a long time you begin to distinguish between one loon calling to another checking out perhaps where its mate is, and the loon's cry of distress or fear. Four sisters and I are back from a week's vacation at our lake house an hour north of St. Benedict's. In addition to the companionship, a few games of card, excellent meals and good reading, there is nothing better than greeting the morning with a cup of coffee and Lectio Divina on the screened-in porch, and savoring the grandeur of God's creation for hours. Each of us was heard musing out loud at least once at the beginning of the week, "There is no schedule . . . really?" It took each of us a day or two to awaken fully to the realization that apart from a noon and an evening meal, our days were our own. It seems that I cannot give myself to reading with the same abondonment here at the monastery as I do at the lake. Many hours of the day were given to reading interspersed with a short nap here and there! Whether sitting on a bench on the dock, on a lawn chair in the screened-in porch as the sun is setting or staring into a fire roasting marsmallows, these special moments in a day at the lake can stir up in us an incredible feeling of wonderment and gratitude. And if singing is prayer for us then our Sister Delores Dufner's hymn Be Forever Praised rises easily from our heart to our lips in a song of praise. Love imagining your setting and the prayerful relaxation. Simply delightful! Thanks for sharing, Sister Helene!